The end of the Tall Ships at Liverpool was the catalyst for the start of the Nobby Owners Association's 2018 summer cruise. As previously posted "Phyllis' visited Caernarfon via the Menai Strait en-route to Dublin. The remaining boats chose to sail (well motor sail) directly to Dublin, the thought was that they would be arriving in time to see the Tall Ships as they sailed down the River Liffey. Alas, the fleet had become becalmed at the top end of the Isle of Man. Meanwhile, the crews took the opportunity to explore the delights of Dublin and enjoy the exceptional sunshine covering the whole of western Europe. 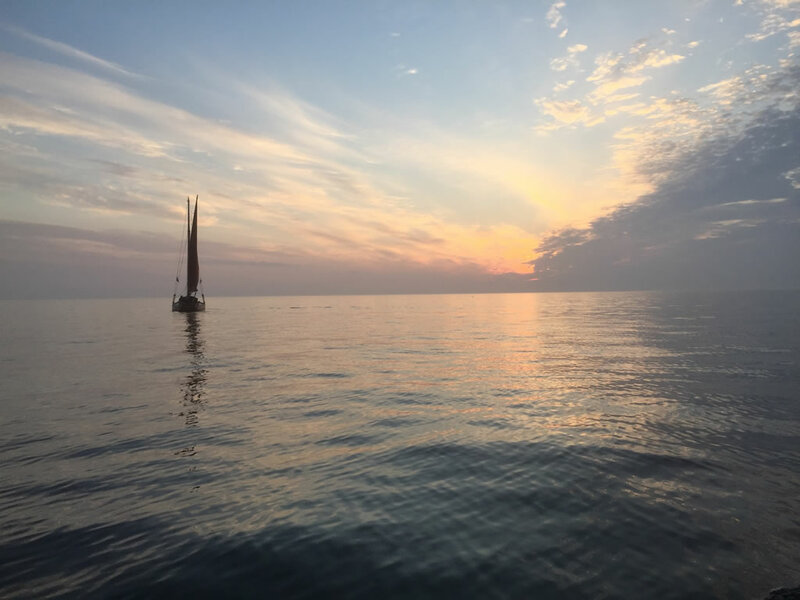 After which we joined in with the Dublin Bay OGA for their annual regatta and their participation with the visiting Tall Ships as part of our summer cruise, our boats then starting our own sailing flotilla together. After watching the departing Tall Ships leave the Liffey we went to Howth Marina for a few days to enjoy the fine seafood restaurants that this major Irish fishing port has to offer. Visits to the quayside restaurants of 'The Oar House' & 'Crabby Joe's' provided much joy and merriment. While at the same time an opportunity to catch up on provisions and a little laundry. 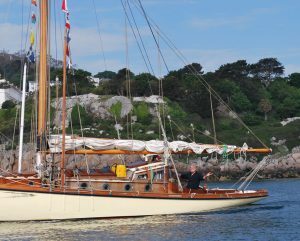 'Adelaide' returned early morning directly to Conwy via Holyhead as some crew had work commitments. 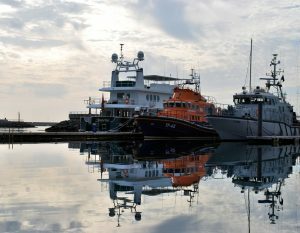 Some of the larger vessels in the marina. With the wind remaining predominantly northeasterly in the offing, and the remarkable high temperatures of the summer we decided to go south to Dún Laoghaire Marina which must be one of the largest in Europe with berthing for 850 yachts. For guests unfamiliar with the marina they despatch a small tender to lead you to your visitor's berth. The pontoons to the offices and services are extensive and they provide a barge mid-way for toilet and shower facilities. In the glorious sunshine, we enjoyed our visit to this pretty little town and their Irish National Maritime Museum. That evening we all gathered together and shared our provisions for an impromptu onboard dinner on 'Phyllis' while watching the various yacht fleets making the best of the weather. The crystal clear waters enabled us to see the fascinating sea creatures attached to the pontoons. We were Joined too by a resident seal in the marina. 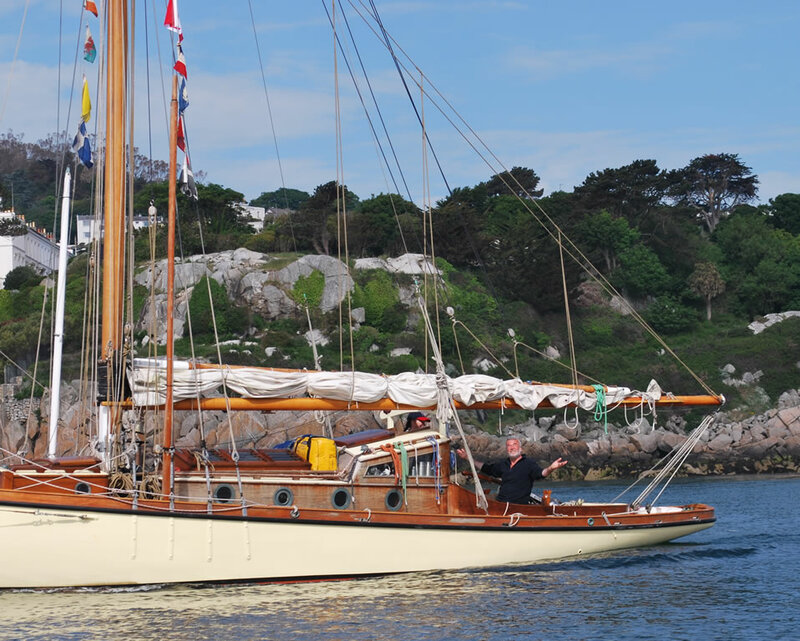 The following day we left Dún Laoghaire Marina and still going south took a wonderful passage thro’ Dalky Sound passing Sorrento Point and Bray Head en-route to Greystones Marina. This new marina is in its last stages of development, the marina office and facilities in portacabins, not a problem as they were wonderfully appointed. A new office and permanent facilities were under construction in a very large block on the quayside which will have a top tier bar and restaurant providing a 360º view of the Irish Sea, the Marina with a backdrop of the Wicklow Mountains and the Great Sugar Loaf. The pontoons were immaculate and the only downside at this time was the unavailability of fuel. Construction of the fuel berth was underway to be completed soonest. A pleasant walk into town for provisions and well, some wine really, gift shopping and coffee shop stopovers all before enjoying another impromptu meal aboard 'Anna Ellidi'. A remarkable flat Irish Sea, a true mill pond..! An early morning start and once again we departed in benign weather conditions resulting in motor sailing across to Wales, on a mirror calm Irish Sea to Caernarfon. Unusually for 'Spray', she lagged behind for a considerable part of the crossing, only just making the tidal gate for the Caernarfon Bar and entrance into Victoria Dock. An excessive amount of fuel was used by 'Spray' who had quite literally 'put-putted' on to the fuel berth for refuelling the following morning. The dilemma causing some head-scratching over dinner in the 'Black Buoy Inn' before retiring for a nightcap in the welcoming Royal Welsh Yacht Club. Once 'Spray' was fully fuelled up she rafted alongside 'Phyllis' to clear the fuel berth. In the bright light of day, and luckily berthed starboard side to, her propeller could clearly be seen wrapped up in some discarded plastic rope and streaming a metre or so of line. Using our boat hook and after tugging and pulling we managed to free the foul-up before the option of diving overboard with a knife in hand to cut-away the rope. Phew..! Bryan tiding up before the crew came aboard. Before transiting the Swellies, 'Anna Ellidi' picked up her mooring at Y Felinheli, formerly known in English as Port Dinorwic. The crew Trash, Tanya and the dog Bosun came aboard 'Phyllis' to sail up the Menai Strait before returning to Conwy. The tides were good for a low water transit of the Swellies but too soon for a direct return to Conwy. A stopover at Menai Bridge and lunch in the Liverpool Arms. 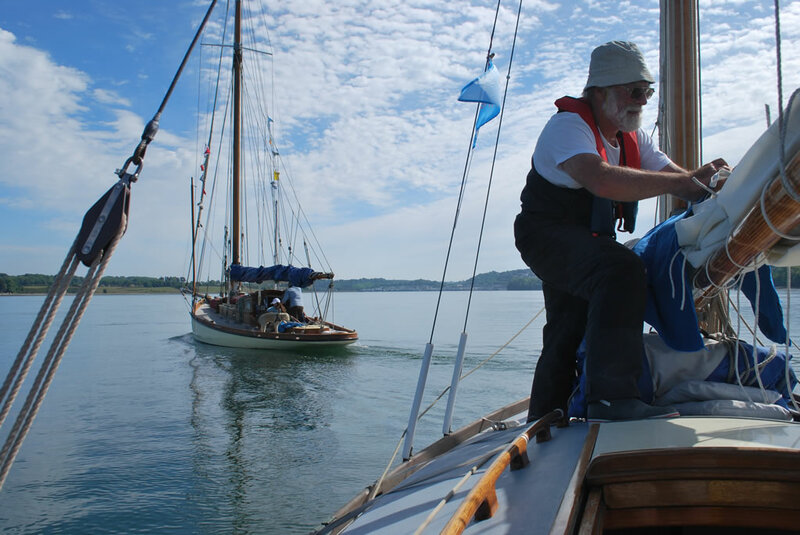 Our final leg saw 'Spray' motor to Deganwy Marina with 'Phyllis' joining in with the local Beaumaris Sailing fleet in a short sail up the Straits. A final drop off of the crew of 'Anna Ellidi' at Conwy Marina before 'Phyllis' crossed the river to her homeport of Deganwy. Although the Summer Cruise was not as expected as we originally planned to go north and then to Peel on the IOM, due to the wind direction and the realisation, with some crews, that the Conwy River Festival was before and not after the Peel Traditional Boat Festival. A southerly route back to the mainland was thoroughly enjoyed. A great adventure in great company.